Í vetur bárust landsmönnum þær döpru fréttir að fuglalífi við Reykjavíkurtjörn hefði hrakað mikið síðustu ár. Það leiddi huga minn að því að ég ætti sama sem engin hljóðrit af fuglalífi við Tjörnina. En einhvers staðar á ég þó upptöku sem ég tók upp framan við Iðnó fyrir 30 árum. Yfirþyrmandi umferðarniður hefur annars valdið því að ég hef ekki lagt það í vana minn að eltast við náttúruhljóð í miðbæ Reykjavíkur. Framvegis skal verða breyting á, því spennandi verður að sjá hvort mönnum takist að endurheimta þá fugla sem verptu og komu upp ungum við Tjörnina um miðja síðustu öld . Tvær helgar í janúar gerði ágæis veður. Arkaði ég með upptökutækin niður að Reykjavíkurtjörn sem var ísilögð. Stóð allt eins til að hljóðrita brak og bresti í ísnum, en ég komst fljótt að því að hann var ekki nógu kaldur, of mikill snjór á honum og að vanda of mikill umferðahávaði. Fuglalífið varð því aðal viðfangsefnið þessar tvær helgar. Ákvað ég að staðsetja tækin á göngubrúnni frá Iðnó að Ráðhúsinu. Tveimur vatnahljóðnemum var stungið í Tjörnina u.þ.b. 20sm fyrir ofan botn með tveggja metra millibili. Fyrir ofan, á brúnni, voru hljóðnemar í XY uppsetningu. Þarna má heyra hundgá, í fólki gefa öndum brauð og í útlendum ferðamönnum. Undir yfirborði tjarnarinnar heyrast mikil skvamphljóð frá fuglum sem börðust um brauðið á yfirborðinu, einnig í skúfönd sem oftsinnis kafaði nærri hljóðnemunum. Þá heyrist málmhljóð þegar gengið er á brúnni og eitthvað slæst í burðarvirki hennar. 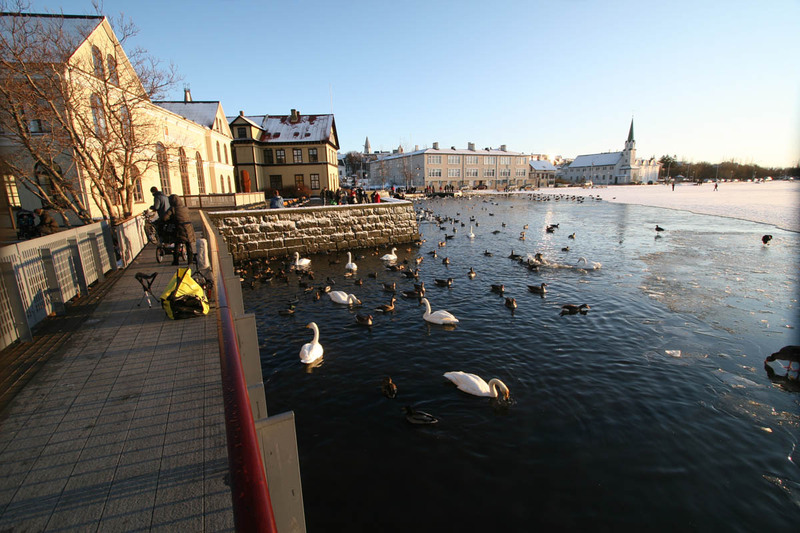 In Reykjavik center is a quiet big pond or a lake with many bird species, like Swans, Gooses and Ducks. Often people feed this birds with bread so outburst is normal when birds grasp the breadcrumbs. This recordings was made simultaneously both above and under water on four tracks. Two hydrophones where placed 2 meters apart and 20 cm above the pond bottom. On the steel bridge above was two cardioid in XY setup. In both worlds. Above and in the pond. Some months ago my plan was to buy Rode NTG3. I was looking for a low noise and better sounding microphone than ME66 I already own. But after some research at home I found this microphone even worse than ME66 for nature recording. The audible noise and sensitivity between these two mics was almost equal, but NTG3 have noticeably higher low frequency response. But what surprised me most was all the noise in NTG3. If something, it was even more than in ME66. But spectrogram shows a shocking pictures for NTG3, a white noise in the whole frequency spectrum up to 50Khz. See spectrogram. This NTG3 was sent back to the shop, but I was never sure if I did some mistakes in this measurements. So last week I vent to the shop and picked up some recording samples on the same NTG3. The recorder was Sound devises 744 at 24bit/48Khz. NTG3 was in channel 1 and for comparison ME66 was in channel 2. They were laying side by side and the gain was in full position. Input filter for both channels was at 80Hz, 12dB/oct. It is no doubt. There is some strange white noise in NTG3. The sound sample below is about two minutes long. First minute is NTG3 and the second is ME66. This particular NTG3 can be defective, so I am waiting for next supply of Rode NTG3 in the shop. I will update this post as soon after I have got a chance to test some other NTG3 mics. See more pictures and spectrogram in this last test. The spectrogram looks very bad for NTG3 but the mic is not as bad as it looks. The ME66 datasheets display referred noise as 10dB(A) and the NTG3 datasheets display referred noise as 13dB(A), so ME66 has lower referred noise than NTG3. 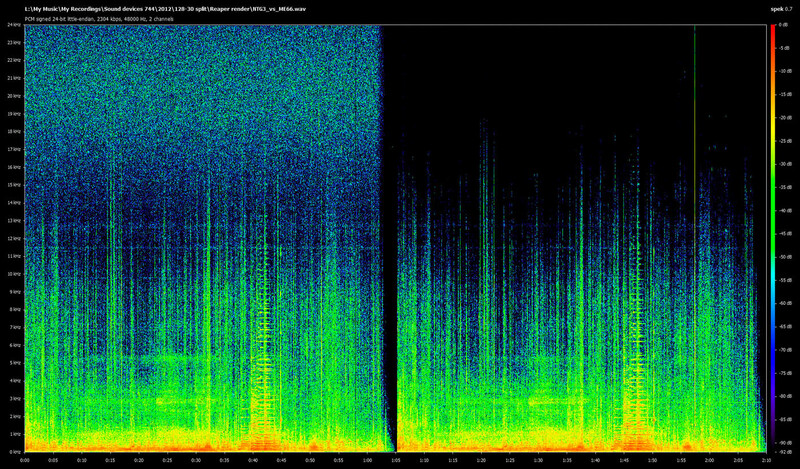 This difference is probably what we see on the spectrogram. This microphones does not have exactly same bandwidth, as the ME66 has a reduced audio bandwidth which in turn reduces the referred noise. The ME66 top end roll off starts around 14Khz (0dB) and is -6dB at 20KHz, NTG3 is +2dB at 14KHz and -2dB at 20KHz. NTG3 is RF biased microphones designed to withstand high humidity and harsher environments than the ME66 condenser microphone. So while the NTG3 and ME66 are both shotgun microphones they are designed for different operating conditions. NTG3 would be my choice for most “normal sound pressure” level. But for quiet nature sounds where most audible sounds are in low level and mid-high frequency, I would choose some other mic. In my opinion Rode NT1a is one of the best. Sadly NT1a is not a shotgun or small diaphragm condenser that can be fit nicely in a Blimp. But NT1a have only 5dB(A) noise and that makes the whole different for those who don’t like to use noise reduction software. See solutions how to fit NT1a in Blimp in NOS and XY setup.